When I was at a conference in Helena, a presenter showed us this app. Book Creator is an iPad app that lets students create interactive ebooks. My students loved the process and product. You can download the ebook here. It should go directly to iBooks in your iPad. I have no idea how it would work on a Kindle, but let me know if there is a problem for Android users. This is a word cloud built by using www.tagul.com. It weighted the words in this website and created a visual collage of the text of the site. My teaching take-away is to have students use this to input thematic words from our curriculum to create a word cloud of their new vocabulary. I'll post student world clouds as they are created. Mr. Kane and his class made a word cloud before recess to answer a community question, "What does a community need?" I really enjoyed creating this Prezi as part of my learning at the MCCE Tech Summit. It became my start-of-the-year presentation for parents at our open house. This is a digital tool to take an image and make it interactive. Each of the icons on the image allow a student to follow a different link to various kinds of media, from YouTube to Google Docs. I can use this tool to extend learning experiences -- like taking a science page and linking it to salient YouTube videos about the topic. This site may be a bit difficult for first grade students, but it is an online assessment tool. It allows students to take an online quiz and gives excellent information about student mastery to the teacher. The teacher creates the assessment, the students take it, and Socrative scores it. Then the teacher gets itemized info on each part and each student in an easy to read format. I am a novice iPad user. As I learn about and teach my students to use apps I will post them here. Letter School -- This is an excellent letter identification and handwriting program. 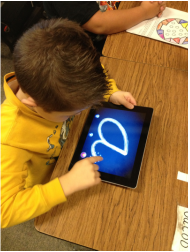 Students trace letters and learn correct letter formation along with phonics. Toontastic -- This is a story creation tool that walks students through the parts of a narrative as they create a cartoon story. Class Dojo -- A classroom management tool, not sure how well it works yet. Three Ring -- A digital portfolio for each student. Not sure how it works yet, but I'm playing with it. Will it be easy enough to use regularly? www.reflectorapp.com -- An "app" for the computer that allows me to reflect my iPad screen onto the computer and projector. MyScript Calculator -- The world's coolest calculator. Apps Gone Free -- A daily listing of paid apps that are now free for a short time. Remind 101 -- Sign up to get my parent reminders via text message. Phew! There are so many web 2.0 tools that I am exploring. Three Ring -- a digital portfolio for each student. I am going to try to implement this 4th quarter. Pinterest -- don't bother following me, but there are several good teachers who I follow. Class Dojo -- a very interesting classroom management tool. We'll see how implementation goes! Teachers Pay Teachers -- I'm looking for free resources. I'll add more as the list grows. For all those parents who need a class list! We learned how to create quick response (QR) codes and use them for instruction. Think scavenger hunts, classroom centers, or interactive games. Here is my digital calling card. Just scan it from your mobile device. QR codes can be used in the classroom to create a step-by-step lesson activities, links to web-based resources, and even text questions. Now all I need are a few more devices to read them! Within three taps, the picture is up on the front board and the student sees himself or herself. I love instant praise and reinforcement of positive behavior. See one of the links under "Just for My students"